Areerat Jantao is one of the many food vendors plying their trade on the streets of Bangkok. 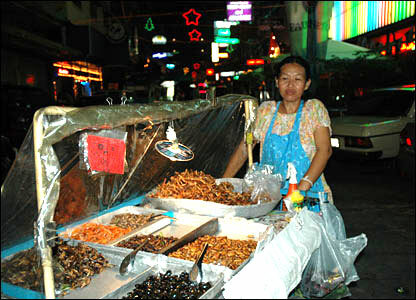 Her fare - fried insects - may not be to everyone's tastes, but she certainly has no shortage of customers. Areerat sells a variety of fried insects on her stall including crickets, grasshoppers, cockroaches, water beetles, bamboo worms and ant eggs. 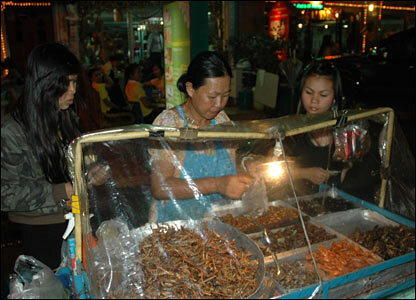 Areerat's most popular offering is a 20 baht (50 cent, 25p) bag of grasshoppers. But she has her own personal favourite. I prefer a type of cockroach with lots of sticky eggs inside, which makes them very tasty, says Areerat. My favourites are water beetles," adds her husband Udon, who also sells insects. This is a very common sight all over Thailand. I know his cos I have spent 3.5 years of my life living, studying and travelling in Thailand. 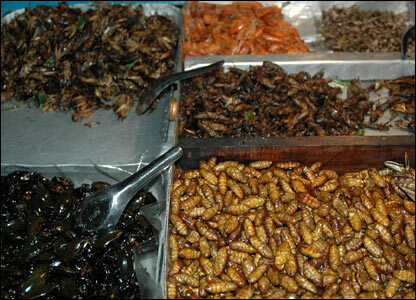 I once had an encounter with such an insect vendor but I could not try these delicacies. Though my friend Deepraj tried some.